Metallic Rebel LTE $377,496, winner of the 2017 Brazos Bash Open Classic on September 25 in Weatherford, Tex., scored 225 points on Monday, October 9, to claim the championship of the PCCHA Futurity Classic Challenge, in Las Vegas, Nev. 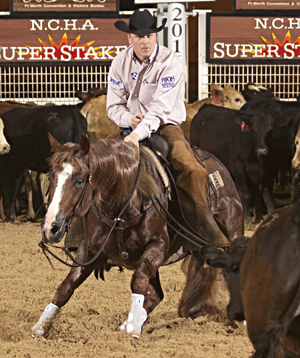 Shown by Beau Galyean for Thomas Guinn, Philadelphia, Miss., the 5-year-old red roan stallion, sired by Metallic Cat, is the leading contender for 2017 NCHA Open Horse of the Year, as well as 2017’s leading money earner. The PCCHA Classic Challenge, with a winner’s purse of $16,000, was Metallic Rebel’s sixth 2017 limited age win and his eleventh major lifetime win.